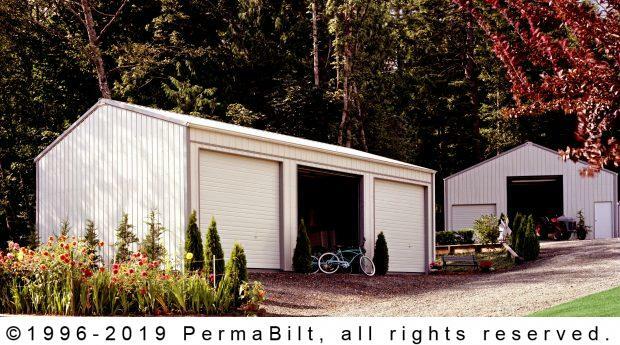 Walk-in door: 3’ x 6’8” PermaBilt® door with self-closing hinges and stainless steel lockset. Our Sultan Washington customer had outgrown their existing building and needed more room. He had seen an advertised building and knew that would fit his needs to a T.
The permit process was uneventful and went fairly quickly. Once the permit was in-hand, we scheduled the crew and gave the customer the green light to prepare the site in the approved location. Once his site was prepared, we ordered materials and before long our crew was on site. Once completed, our customer confirmed that this three car steel garage building was the perfect match for his needs and he was very pleased with the quality of the building and the service. "Thank you for the great service. We were very pleased with the job done."